Nothing is better on a hot summer evening than sitting around on the back porch with good friends drinking a cold beverage and enjoying delicious boiled shrimp. 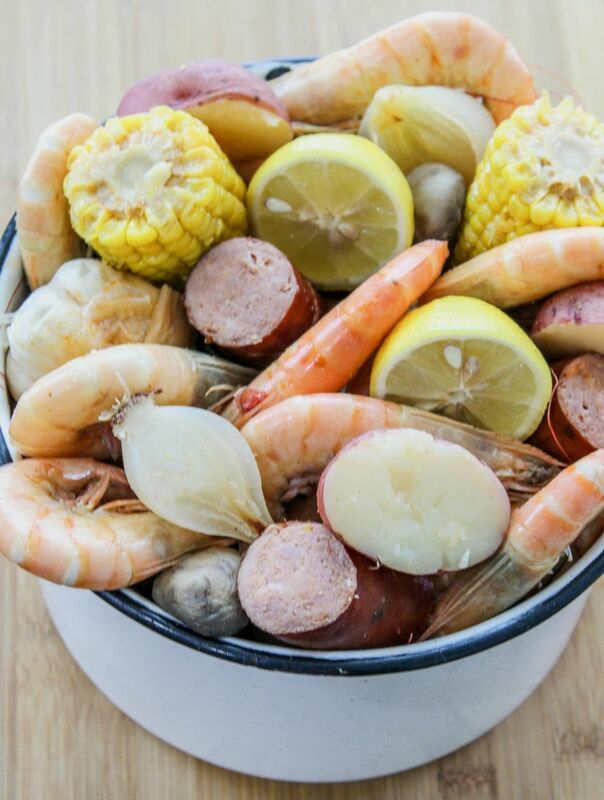 Your guest will be impressed when they arrive at your home to find you serving boiled shrimp instead of the usual summer food like hot dogs and barbecue chicken. This Spicy Cajun Shrimp Boil is easily prepared on the stove and only takes 30 minutes or less to cook. When my family and friends gather on the weekends, the men usually take turns grilling and bragging who can cook the best grilled hot dogs, hamburgers, ribs, and chicken. The women sit and listen to all the stories the men concoct about their grilling abilities and laugh how each of them think they’re the king of the grill! Except when I boil up this Spicy Cajun Shrimp Boil recipe there’s no exaggeration how delicious it tastes. I get all the bragging rights for how fantastic the shrimp, potatoes, corn, sausage, and mushrooms taste. Note– My family uses fresh large shrimp that we purchase from a local seafood market here in Louisiana. You can use frozen shrimp if needed as long as you thaw them first. 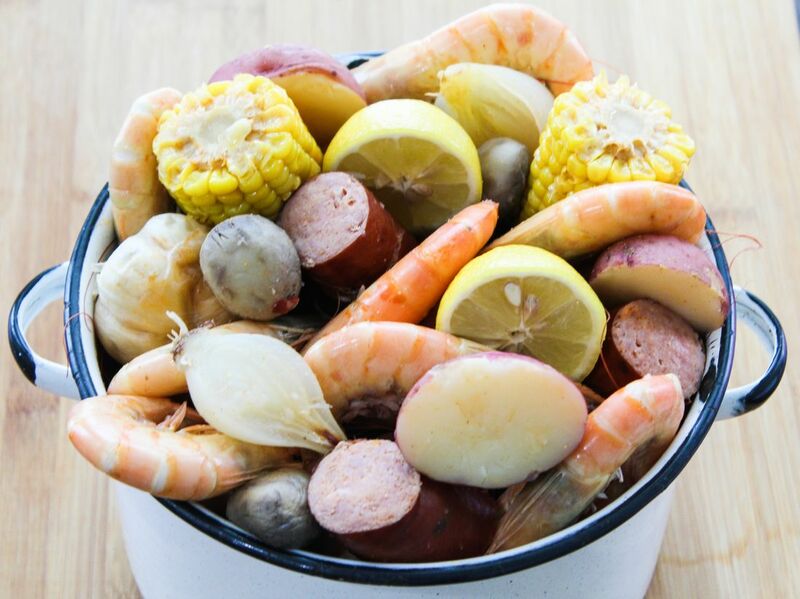 You can boil the shrimp in a big heavy stockpot on the stove or cook the shrimp outdoors using a propane cooker burner and add your favorite vegetables and sausage. My family sometimes adds celery and hotdogs to our seafood boils; it just depends on the type of seafood we cook and how many people will be eating. 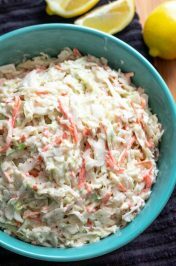 We have been known to boil over 100 pounds of crawfish at one of our gatherings and add all kind of different sausages, hot dogs, cauliflower, and other vegetables to the boil. 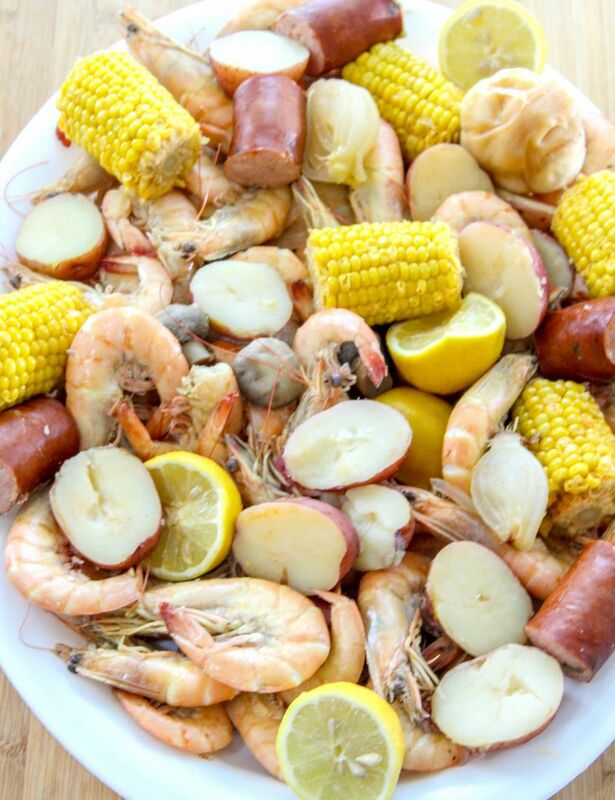 Serve the Spicy Cajun Shrimp Boil on a platter or give each guest their very own bucket of shrimp with a side of ketchup with mayo mixed together as a dipping sauce or some cocktail sauce. If your guest don’t like their seafood spicy adjust the amount of seasoning you use. The taste and spiciness of the seafood usually depend on which brand of seasoning you choose to use and the amount you add. My family usually uses Louisiana Crab & Shrimp Boil, but we have been known to use Zatarain’s and The Crab Man Plus seasoning, too. Note– some people like to sprinkle seasoning on top of their boiled seafood before eating it. I personally do not because I tend to get migraines if I use too much spicy seasoning. You can sprinkle on Old Bay seasoning, Slap Ya Mama, Louisiana Cajun Seasoning, or your favorite brand. 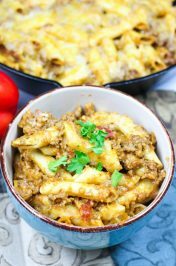 I hope you enjoy this recipe. Make sure to put out plenty of napkins and cold beverages for your guest before serving this delicious Spicy Cajun Shrimp Boil. Do you have a favorite shrimp recipe? 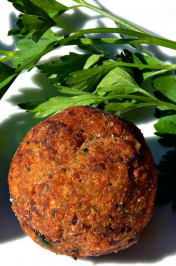 Here’s some other recipes you might enjoy: LOUISIANA CRAWFISH BOIL and LOUISIANA CRAB BOIL. In a heavy 25-quart stockpot, bring water to a rolling boil. Add in the liquid & powder crab boil and stir. 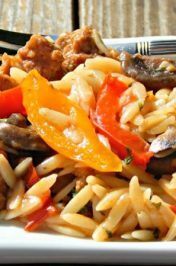 Pour in the sausage and other ingredients except the potatoes, corn, and mushrooms. Cover and bring to a boil. Let boil for 10-15 minutes. Add mushrooms and potatoes and return to a boil and cook for another 5 minutes. Put in the corn and boil for another 15 minutes. Add shrimp to the the pot, cover and return to a boil. Boil for 2-3 minutes. Immediately remove the pot from the heat and add the bag of ice. 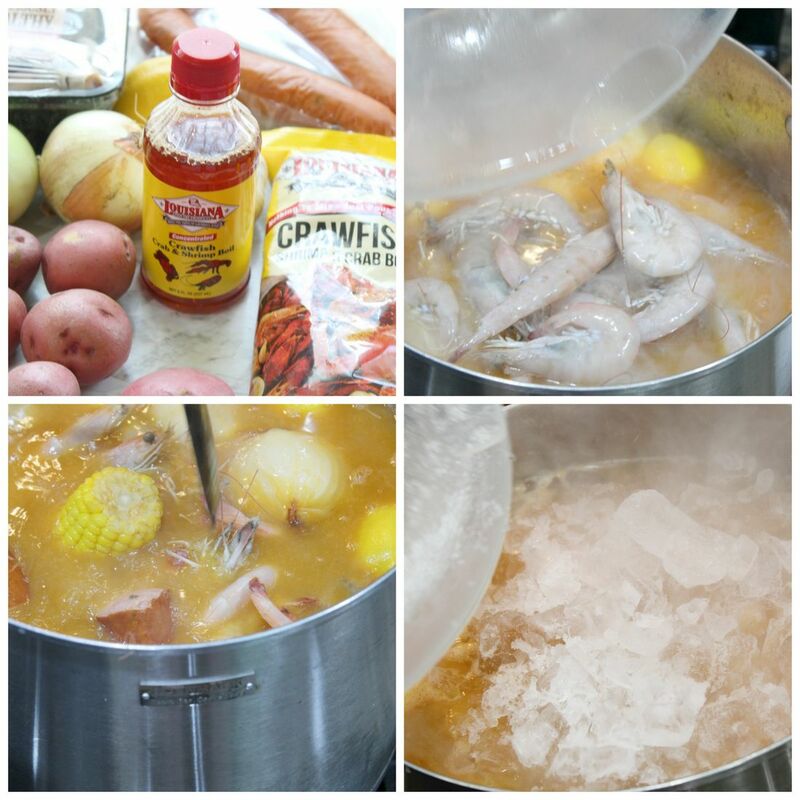 Let the shrimp, potatoes, sausage and other ingredients soak in the ice water for 20 -30 minutes. * Letting the shrimp and other ingredients soak in the ice water will help the flavor be absorbed. Drain the shrimp and other ingredients using a strainer and place into individual buckets or serve on a serving platter. Enjoy! Make sure to serve with plenty of napkins! Enjoy! !